Category Archives for "Funnel Sales System"
Funnel X ROI is promoted as a $300 per day automated system for making money online, and it sounds awesome, but is it really is amazing as you are told? Can you really make easy money with this “done for you” system just like David Dekel has been doing? Is this worth buying into… Or I guess I should say getting into since it is “free”? Or is Funnel X ROI a scam that you would be better off avoiding? There is a fair amount of misleading information out there that will probably give many people the wrong picture of what is actually going on here. This is where I come in… In this review I’m going to be going over what exactly Funnel X ROI is, how it works, etc. This way you can have a better idea of what you’re really getting into so that can make a more informed decision of whether or not it is really worth it. I’m not particularly a fan of funnel systems like this, but you can make money with them as I will explain. Funnel X ROI is a funnel system that was put together by David Dekel. He claims that this is his exact $300 per day system, although he makes much more than that most of the time. He also claims that you can start using it today to make your first $100 quickly… Even as soon as today if you’re totally new. He goes on to say that you don’t need any experience at all and that you will be getting this 100% free. The funnel is “done for you” and basically all you have to do is “plug in” to it. He provides a step-by-step guide on how to do everything, how to set everything up, and how you can double your income without doing any extra work. David says that he went through a lot of trial and error setting up the system, but you can avoid all of that by getting in for free. All you have to do is “step out of the way and let my system handle everything for you”-David Dekel. You court led to believe that you just have to configure your affiliate account and you are going to be able to make tons of money automatically and very easily. By the sounds of things you’re going to be able to easily flood the system with visitors which will make you money. And of course you’re getting one heck of a bargain, as he tells you. He claims that this system is completely free for the time being as long as you are willing to submit a video testimonial after finding success with this system. Apparently he plans on charging $1997 after he gets enough testimonials, but I don’t know exactly how true this statement is. Below I am going to give a brief overview of how the system works, which might be confusing at first, but I will better explain it in a bit. So if this is confusing, don’t worry. After watching the first video presentation, which are just one over, you will be able to enter your name and email to activate the system. This is the first step that needs to be taken. Next up you have to configure the system, which basically means you have to sign up for a bunch of other programs/systems so that you can make money. The first step here will be to sign up for a program called Easy 1 Up. This it is basically a high-ticket recruitment scheme where members recruit people in, earn commissions doing so, and then those recruits go out and recruit other people in… Repeating the process. Members are provided with premade sales funnels and marketing materials, along with training to be able to go out and recruit others into the system. The second step is to create a Now Lifestyle account. What is Now Lifestyle? This is a health/fitness MLM company that is largely focused on recruitment. Of course the goal with this whole Funnel X ROI thing is to make money, so the health/fitness aspect is going to be irrelevant… Your focus will be on recruitment and making money. And Then you will be pushed to create a ClickMagick account, which is an analytics service that will help you better analyze your traffic and improve conversions. Lastly you will be pushed to sign up for a pay per lead program, which turns out to be called Funnel X Advance. This appears to be a high-ticket program that David Dekel put together on top of Funnel X. There are different memberships including Starter, Builder, Super Affiliate, and Leader. And after you have all of that set up your finished and are ready to start promoting the system. You’re ready to start flooding the funnel with traffic and hopefully will make some money doing so. So basically what you are doing here is promoting an opportunity for people to make money online. You are promoting Funnel X ROI as a way to make $300 per day and when people get sucked into the sales funnel, they are then pushed to buy into the same line of programs that you work, which include Easy 1 Up, Now Lifestyle, ClickMagick, and Funnel X Advance. This is where you will be making your money. Funnel X ROI is a free system, but of course it costs money to buy into all of these other programs/systems. Take Easy 1 Up for example… The cheapest product package is $25 and with that you will be able to make money when other people by the $25 package. However, you can buy the more expensive product packages, such as one that is $1000 and earn much larger commissions when other people purchase the more expensive packages. And when it comes to Now Lifestyle it is all about recruitment. First you buy in and then you want to recruiting as many people as possible because you earn commissions from what they do. ClickMagick may seem like an innocent analytics service to help you improve conversions, but you will also be able to earn commissions when you send people into the funnel and they buy into this as well. Everything in this funnel you will make money off of, or I should say you will “be able to” make money off of. In a nutshell: You were funneled into the system and were pushed to purchase all of these programs/systems after everything in which you can then make money off all by sending other people into the funnel. Funnel X ROI is basically a remake of Funnel X Project that I reviewed in the past. The old Funnel X Project version pushed you to create a MoneyLine Exchange account, join MCA, join Aweber and join ClickMagick. This Is basically the same type of deal but it just promotes different systems/programs. There are also a lot of other similar systems out there that I have reviewed. Some that come to mind include WiFi Wealth System and Digital Genius Lab. You Will NOT Make As Much As David! The Sales pitch for the system can be pretty misleading. David talks about how he was generating $18,000 per month by the fourth month and he barely knew he was doing at this point. He also shows a video of how he made $170 while he was taking a shower in the morning. Sure… I guess this is possible… But it’s very misleading because he was the one that created the system so he has the advantage. When it comes to MLM’s and “1 up” systems like Easy 1 Up, there is a massive advantage at being at the top. A MLM has a pyramid -like structure where commissions flow from the bottom to the top. If you are at the bottom then things are actually more difficult for you to make money, but if you’re at the top then the commissions are flowing up to you, making things easier. But Can You Make Good Money With This? Sure, you definitely can make money with this. I see no reason why you can’t. All this system really is, is just a sales funnel that allows you to make money with various other programs/systems. Based on the many very similar systems out there that I have reviewed, there is no doubt in my mind that you can make money with this and some people will make a good bit, but don’t think that it is going to be some easy “get-rich-quick” type of deal. I wouldn’t consider this a scam but I do have a bit of a problem with the somewhat deceptive marketing tactics going on here. What I mean is that the majority of people getting involved here probably have no idea what they are really getting involved in. It is promoted as a good way to make money online but much of the details are left out. As far as the future of the system goes, I wouldn’t doubt if it changes up a good bit with time. The reason I say this is because I can definitely see Easy 1 Up getting shut down by the government in the near future. Why? Well… Because it is nearly the same type of recruitment scheme as MOBE and Digital Altitude, which were both shut down by the FTC recently for being scams. 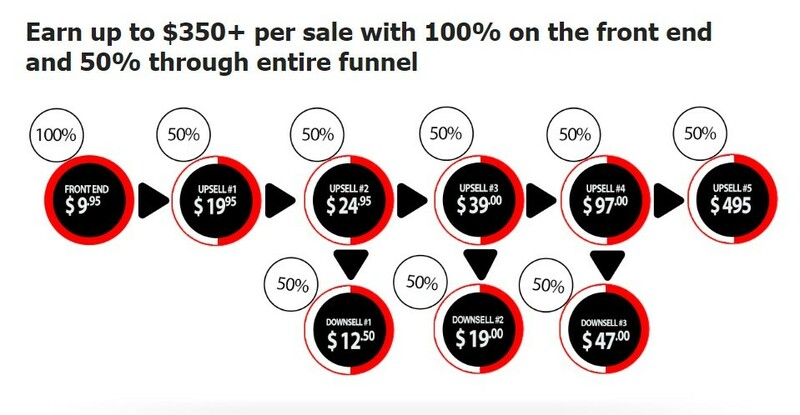 But that is the good thing about a funnel system like this… It can easily change the offers that is promoting and evolve as times change. If you are A beginner looking to make money online, you can definitely make money with Funnel X ROI but this isn’t something I would really recommend all that much.One of the main reasons I say this, besides the fact that the marketing of this system is pretty deceptive, is that “done for you” systems like this are never that good of an idea in my opinion. The reason is because you are not learning very much due to the fact that much of the work is done for you. This also creates a problem because you become totally reliant on the funnel system, which from what I have seen will not likely last all that long, judging from other funnel systems I have seen come and go in the past. If you are looking fora legitimate way to make sustainable money online then I would suggest taking a look at how I went from $0 to over $6000 dollars per month online. I’ll explain what exactly you do, how it all works, and how beginners can get started creating their an online business like I did. Yoonla Review – Is This Just Another Scam Program or Can You Really Make Money? Yoonla is promoted as an easy and mostly “done for you” way to make money online, but is it really? Can Yoonla really help you build the “ultimate digital lifestyle”? Or is this all just a bunch of hype… Is Yoonla a scam that you should be avoiding at all costs? Now I know some members are probably going to be upset that I am even asking the question of whether or not it is a scam, but this is definitely something that needs to be addressed. While I don’t consider it to be an outright scam, I do think that it is somewhat of a shady business operation which I will be addressing in this Yoonla review. In this review I will be going over hopefully everything you need to know. The purpose of this is to give you a better picture of what exactly Yoonla is before deciding to either join or avoid it. And by the way, I am not a member of Yoonla so I am not promoting it… Which means this review is going to be a lot more unbiased than most. Should You Be Worried This Will Get Shut Down? So first off… What the heck is Yoonla? Yoonla it is basically an online marketing program that provides you with training so that you can set up a sales funnel system to go out and promote Yoonla to other people. it is possible to make money promoting other products, but the problem is that unless you have experience in online marketing,this might be out of the question, which is why I think Wealthy Affiliate is a much better choice. They focus just isn’t on this… It is centered around promoting the program. The program was founded in 2016 by Reno Van Boven, who is a guy from New Zealand. Since 2016 as one through a number of changes and is still evolving quite a lot. So if you read older reviews, they might be describing a system that is a lot different from what it is today. As I said, this program is focused around being able to make money by promoting the program to other people. It is the sort of thing you buy into to make money online and then try to make money online by promoting it to other people. You are able to join as a free member, but in order to make money you pretty much are going to have to take out your wallet. Throughout the training you will be guided through steps to set up a sales funnel for the Yoonla program, which you will then go out and promote… Getting others to join in making money when they do so as a free member and when they upgrade. When it comes to recruitment focused programs like this I know a lot of people to around the term pyramid scheme rather loosely. But is this a pyramid scheme…? Well… It is starting to look more like one. Recently they started implementing a compensation structure in which they now have 2 tiers. What this means is that not only can you make money by recruiting in new members, but you also can make money by the members that your recruits recruit in. That said… No this is not a pyramid scheme… It is simply a program that focuses largely on getting members to recruit others in and has a 2-tiered affiliate program in place. The Starter Membership is the free one… This is where people first to join at. With the free membership you get step-by-step training, although not very much of it, and it is mostly geared towards getting you to upgrade to the Elite Membership. One thing that you definitely need to know is that, although this membership is free, there are additional costs and you will have to take out your wallet in order to follow along with the system. Getresponse – This is in autoresponder service, similar to Aweber, and it is necessary if you want to move forward that you pay for it, the cheapest option being $15 per month. I’ll get more into this all in a bit, but basically in autoresponder allows you to collect leads and then follow up with them via automated emails. This sort of thing is a big deal to any type of online business. Yahoo Small Business – You referred to purchase a domain and website hosting with Yahoo Small Business. Of course this is something you definitely need in order to host your landing page, which will be used to promote Yoonla, and this will cost you around $70 per year. LeadPages – This it is a service that is recommended where you can create really nice looking landing pages, which will be used to capture leads. However, it is expensive and optional. The Pro option is recommended in this costs $48 per month, paid yearly which is $576. With the Elite Membership you get access to the advanced training, marketing materials, and also to the private FB group where you can communicate with others. In order to become an Elite member you must purchase the Getresponse autoresponder service as well as the Yahoo Small Business website hosting service. And you must do so through the provided links in the training, which are affiliate links that Yoonla makes money off of you with. So this is going to cost you about $85 per month minimum. There is also talk about the Elite membership costing as much as $297, but I am not sure if this is actually going to take effect or not. The program is constantly evolving and changing, so maybe in the future… But not right now. The point of upgrading to the Elite membership is not just the fact that it provides more in-depth training, but also the fact that it allows you to make more money with the CPA affiliate program, which I will go over shortly. As I mentioned in the beginning, Yoonla has different phases. Right now it is in the Yoonla “Evolve” phase. With each new phase there comes updated training and usually some changes to the affiliate program. The first step is to download the “Evolve App”, which is just a zip file. At this point you probably have no idea what the heck is going on. All you know is that you are downloading some file because the training tells you to do so. This file that you are told to download is used to create your landing page, or “squeeze page” in one of the following steps. This step is all about signing up for a Getresponse account, which is the autoresponder that I discussed. This will cost you a minimum of $15 per month and with this monthly plan you will be able to have a list of up to 1000 subscribers. Autoresponders are very important when it comes to online business. These allow you to collect leads and then follow up with them by automatically sending out prewritten sequences of emails, which makes things a heck of a lot easier. In this step you will be instructed on setting up your Getresponse account and will also be provided with a prewritten welcome email to get your follow-up series started. Now it is time to create a web hosting account with Yahoo Small Business. 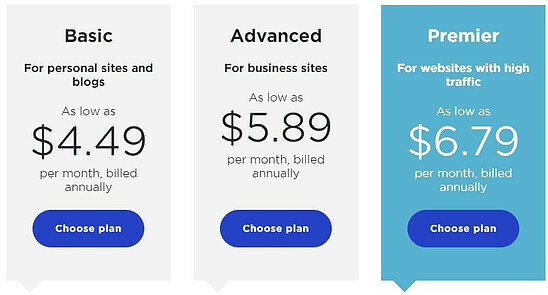 There are several different hosting plans available, but you are told not to purchase the “basic plan”. The reason for this is because with the basic plan you can’t use FTP, which you will have to do in the next step. Now you have your website ready and it is time to upload that zip file that you downloaded in the first step, which is your premade landing page. To do this you will need to use FTP, which I am not going to get into, but basically it is a way to upload large files to your website that can be uploaded by normal means. Now that your landing page has been uploaded to your website, you will be instructed to make some small changes in order to make it somewhat unique. And the last step is to simply make sure that you have completed all of the steps and then you will be able to activate your affiliate sales funnel. In addition to these core seven steps that you are taking through, there is also some free training on promoting Yoonla via Facebook, YouTube, and Instagram. Okay… So this might all be a bit confusing but I will try to summarize it best I can. The file that you have to download is your premade landing page for promoting Yoonla that you will be uploading to your website. Of course every website needs hosting, Ian you are instructed to purchase website hosting through Yahoo Small Business, which you have to do if you want to become an Elite member. Once you upload the premade landing page to your website, this is where the Getresponse autoresponder comes into play. You will be promoting Yoonla via your premade landing page and when people come to that page they will enter their email, which will then be sent to your autoresponder. In with your autoresponder service you will have a series of follow-up messages in place in case they do not sign up for Yoonla the first time around. I Hope this makes a little more sense now. Okay… So obviously the training provided at Yoonla is largely focused around, will pretty much entirely focused around, getting people to go out and promote the program to other people. But how much money can you actually make doing this? Well… As I stated in the beginning, this place has what you could call a CPA affiliate program. CPA stands for “cost per action” and this is when you get paid when your referrals complete a specified action. The action that you get paid for could be to watch a video, and earn some contest, sign up for some free trial, and so on. The action that you are getting paid for here is when you get referrals to sign up for a free account. There is a lot of contrasting information out there, but it seems that you can get paid and anywhere from $2 – $5 when you refer someone that creates a free account. The amount that you get paid depends on the country of the person you are referring. If you refer people from countries such as the US, UK, Australia, Canada, New Zealand, and maybe some others… You will earn more than when you refer people from countries such as India, Brazil, Mexico, etc. The reason is because people from the latter countries don’t convert as well. When someone that you refer upgrades to an Elite membership, you can earn $40 commissions. In addition, you can also earn $35 commissions on the 2nd tier upgrades, which are the upgrades of members that your referrals recruited in. These commissions have been increased since the previous phase of Yoonla. Now you might be wondering how this affiliate stuff works, and I will briefly explain it: when someone clicks on your affiliate link, they get directed to the Yoonla websit where their IP address is logged and a “cookie” is placed in their browser. The Yoonla system then recognizes this person as someone that you referred so that you get credit for it. Even if this person leaves and comes back in six months, you will still get credit. In order to get paid you must first refer at least two customers and you will get paid on the 1st and the 15th of each month. There used to be a $100 minimum requirement before you could get paid, but it seems that they did away with this. The training that is laid out is very clear. There is no question what you should be doing next. It is laid out in a step-by-step manner and there is no reason why anyone should get lost. One thing that I noticed is that Yoonla is usually promoted in a reasonable way. 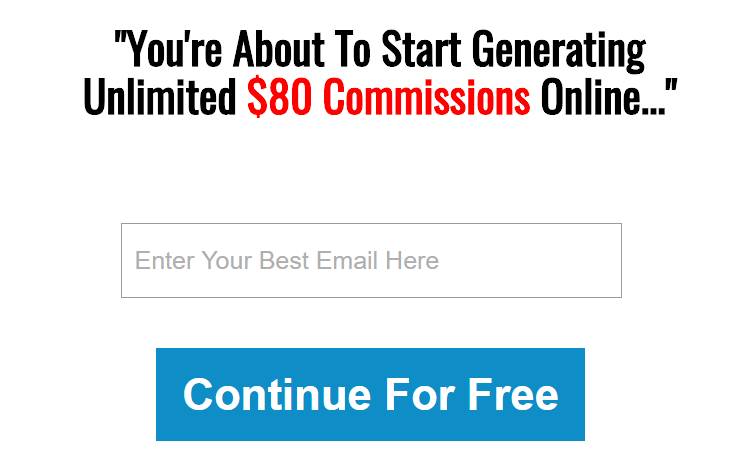 It is not promoted as some “super easy way to make $500 per day online” like you see with many different online marketing programs out there, such as Fast Income Generator for example (scam). The fact that the compensation plan pays out a mixture of CPA and affiliate marketing earnings is nice. Although you don’t earn nearly as much when someone just signs up for a free account, which would be the CPA part of it all, it is still nice because this is much easier to get someone to do. I really… really don’t like how this system is pretty much completely focused on getting members to go out and promote the system. There are so many different “make money online” programs out there that do the same thing. They provide people with a way to make money that also helps them make more money… Which seems to be what it is all about. Having all this “done for you” stuff may sound awesome. I mean who wouldn’t want a premade landing page that you can use to promote the system? Who wouldn’t want everything to be this easy? Well… It does make it easy for newbies to get started, but it only hurts you in the long run. All you know how to do is promote Yoonla with this system… That is it for the most part. I mean you could throw in a few other products in your autoresponder follow-up series, but there isn’t really any focus on this in the training and you probably won’t see very good results. With this system your pretty much 100% reliant on the system. You gain a little bit of knowledge and skills, but you will be far from an independent online marketer and this is a problem, especially since systems like this don’t seem to last very long. Should You Be Worried About This Program Being Shut Down? I know there are some people out there that are afraid to get involved with systems like this because they feel that they might end up getting shut down after they have already dedicated a bunch of time and spent money trying to make it all work. Could Yoonla get shut down in the future? Well… It is possible. Lately we have seen other somewhat similar programs that have been shut down by the FTC here in the United States. This includes Digital Altitude’s Aspire program the end the infamous MOBE program. Now both of these programs are a good bit different from Yoonla, because they are what you call “high-ticket” programs which include upsells that cost thousands of dollars, but they are similar in the way that they all focus on getting members to go out and promote the same system to other people as a means to make money online. MOBE is the more similar out of the two because it also had a 2-tiered affiliate commission structure in place. MOBE was shut down for being a fraudulent business mostly due to luring in newcomers without giving them a clear picture of what they would be getting involved with, such as not clearly explaining the real cost of the program. Yoonla it is somewhat similar in this respect, you don’t really know that you’re going to have to purchase the autoresponder and website hosting. It is not until you are already going to the training that you find this out. That said… The products pushed on you here are not as expensive as those of MOBE and they don’t have the extremely over inflated prices that MOBE’s products had. It it is a bit sketchy though for the “make money online” program like this to be pretty much solely focused on getting members to promote the system to make money online. So it will be interesting to see what happens with this program in the future. Believe it or not, I really didn’t find all that many complaints about this place online, which I was surprised about. However this could be due to the fact that members are not charged massive amounts of money, so if they do end up failing and quitting they are not as upset. There have been several complaints I came across about people not getting approved to receive the amount of earnings that they earned. It seems that these people are getting credit because they have violated those or something of this nature, but it is unclear. This is probably one of the most common complaints I came across. The support that Yoonla features a bunch of people that don’t really know what they are doing, according to what others have said. And of course there are some complaints from people who have lost money in this program. They follow the training… But the recommended services… And claim to have did everything right but still did not make any money, or did not recoup their investment. This is a complaint worth mentioning, because it shows you that this is not as easy as you may think, but this is something you will also find with any “make money online” program out there. People are going to fail… There are always going to be people failing no matter how good the training is. Final Thoughts – Recommended or Not? While I don’t consider Yoonla to be a scam, this is not something that I am going to recommend. The two main reasons I don’t recommend it are….1) the entire system is focused around getting you to promote the system, which just makes Reno a bunch more money, and 2) you don’t really learn all that much it… Your pretty much stuck with promoting the system as your only way to make money. Overall I don’t think the system is all that great in think there are matched better options out there. There are some testimonials from people who have supposedly made good money with Yoonla, but they really aren’t all that many considering this place claims to have had over 1.5 million people join, most of which probably ended up quitting early on or just failed to ever become successful. Affiliate marketing is a great way for beginners to get started making money online, which is why most online marketers get started doing such. The reason affiliate marketing is so great is because you don’t have to worry about coming up with your own product or anything like that… You simply promote other people’s products and earn commissions doing so. As you know, it Yoonla does have their affiliate marketing program, but the problem is that this is only for promoting Yoonla, which is all that you will know how to do. There are tons of products out there you can promote to make money with and Yoonla fails to teach this. My number one suggestion, by far, if you are looking to get started in affiliate marketing would be the Wealthy Affiliate training program. This is actually the same program that I got started with back in 2015 when I first started looking for ways to make money online. And I know from experience that it works, because… Well… I make a living doing this stuff now. Wealthy Affiliate training program is much more robust and provides step-by-step training on all aspects of online business, so that you can create your own sustainable online business you not be completely dependent on some single system for making money. If you have any comments or questions than just leave them down below in the comment section and I’ll get back to you soon 🙂 I hope you enjoyed this review and found at least somewhat helpful. 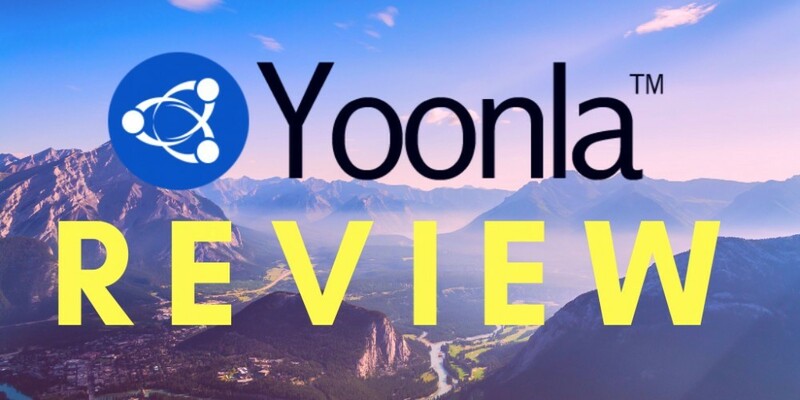 If you have been a member, or still are a member, of Yoonla and have anything you would like me to add to this review then I would really appreciate hearing about that below as well. 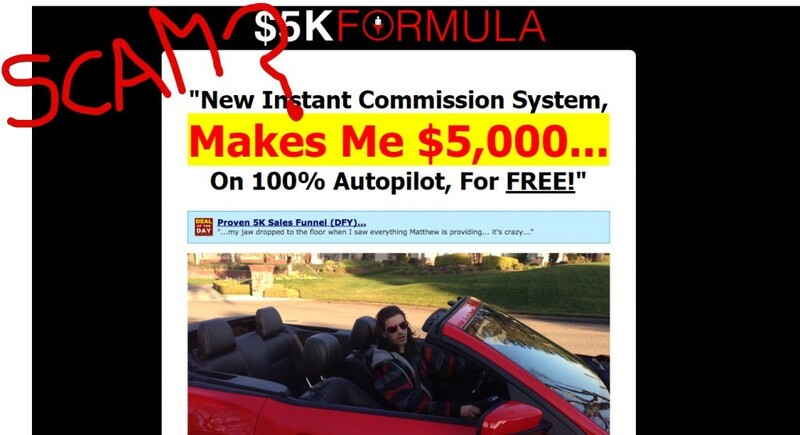 The 5K Formula is a system that was created by Matthew Neer that supposedly can make you $5000 on autopilot… For free. But can it really? I hear about systems like this all the time that are supposed to do amazing things, such as make you quick and easy money, but it seems that many more times than not they turn out to be complete busts. Is this the real deal or is the 5K Formula a scam that you should just avoid? In this review I’ll be going over some important things that you should know about this system. No, it is not nearly as amazing as it is said to be and I’ll explain why I am saying this. Can you make money? Yes, you can… But there are some definite downsides to it. The system was created by Matthew Neer and he tells you that he makes $5000 on autopilot what that… For free, as I already mentioned. He doesn’t tell you what timeframe he makes this money in, but he does show you some screenshots to show him making thousands of dollars per day… Which I’m guessing is supposedly coming in from this one system. The system is said to be “done for you” and he refers to it as a digital ATM. What you are told is that all you have to do is set up the system and it then runs on autopilot for months. Sounds incredible doesn’t it? But then again, doesn’t that sound a bit too good to be true? It does to me… especially with knowing that Matthew often puts out products that are over-hyped and not nearly as good as he claims, such as Viral Cash App and Viral Money Method. I’m guessing that you probably do think that this system sounds too good to be true. You are reading my review right now for additional information so you’re probably skeptical of the whole thing, as you should be. Whenever things sound too good to be true they usually are… At least that is what I have learned from my experience in the online world and having reviewed hundreds of scams. But anyways… Matthew says that he is letting people in on his system because it is mutually beneficial. He says that when you make money he also makes money and this leads to him really trying to help everyone make money because he gets a kickback. How it works is you get a copy of the system. It is one of the systems that you buy into looking to make money online and then you make money online by getting other people to buy into the same exact system. The system consists of a sales funnel that is a series of up-sells and down-sells. You will make 100% commissions from the front end product, which is 5K Formula, and then you will make 50% commissions from all of the up-sells and down-sells afterward. The same funnel that you just got sucked into is what you are going to be sending other people into. Do you remember the sales page you landed on for 5K Formula? You know… The one where Matthew drives to the bank to take out $5000 in an attempt to prove that the system really works. You will send them to the beginning of the sales funnel and then the rest is taking care of for you. They are then sent through the series of up-sells/down-sells that I just went over above. So if they buy and you will get 100% of that initial sale. At the time of me writing this review the price is $19.97, however I have seen this sold for around $9 in the past, so the price varies. And then of course after the initial sale you will get 50% of the other sales. What you have to realize is that the same thing is happening to you and everyone else. When you buy into the system you are also sent through a series of up-sells/down-sells… The same thing I just went over above. Just as you are promoting the system in trying to make money off of other people, someone promoted it to you and sent you to the sales page. Okay… So the sales funnel is in place, the products are in place… All you have to do is drive traffic to the offer. Sounds pretty easy doesn’t it? It sounds easy but the fact of the matter is things are never as easy as they sound, at least not in many cases. How are you going to drive traffic to this offer? He tells you that you are provided with different traffic sources in basically all you have to do is select what you want and that is that. One of the traffic sources your commands is a paid traffic form that requires a monthly subscription. You are also provided with classified ad postings so that you can make use of free advertising methods as well. He gives you access to premade squeeze pages, banner ads, emails, and some other resources. This definitely makes it easier on you one promoting the system, but it is still going to be a much more difficult task than he leads you to believe. If you have experience with online marketing or have a means to drive massive amounts of traffic, such as a large social media following or a popular website, then this is something you would no doubt make money with. But for most people looking into this, who are more than likely beginners, you will find out very fast that things are harder than they seem. The system makes it very easy for you. You are provided with hosting and everything. This is great and all… But it makes you pretty much totally reliant on the system itself. The problem here is that if the system disappears, so does your income… And I see systems like this, and go all the time. The easy way is and always the best way, and in this case it definitely is not the best way. You do not actually learn anything. You are just given the funnel system and provided with pre-made ads to run basically. I mean sure, you will learn a little bit about online marketing which you will be able to apply to other business ventures, but you really aren’t learning much at all. And as I said, I see systems like this, and go all the time. It is a risky business to get involved with because you never know when these types of systems are going to vanish from the face of the earth. 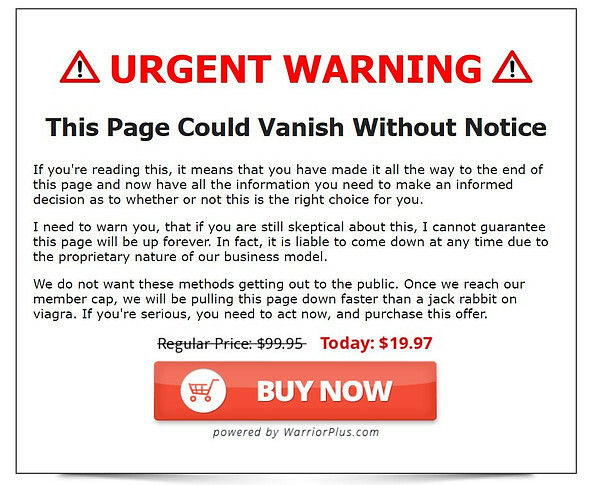 In fact, on the sales page a even gives you an “urgent warning” and says that “this page could vanish without notice”. Now this is just a sneaky little marketing tactic that is designed to get people to buy into the system as fast as possible. It is a form of false scarcity that makes you believe you better buy in right now before this offer is gone. But what if there is some truth to this warning? In my opinion there is. Overall this is not a system that I recommend. Not only do I not really care for “done for you” systems like this because they don’t actually teach you much and provide little value, but I can also guarantee you that a system like this is going to be much more difficult to sell than it may seem. It may seem like a piece of cake but the reality is going to be much different. Just think about it… You are reading my review right now because you are hesitant to buy into it and suspicious of the whole thing. A lot of people are going to be suspicious of a system like this because it sounds way too good to be true. Also, something that I didn’t mention is that there is training that is apparently locked within the system and you actually have to make a certain number of sales before you can unlock this more advanced training. Anyways… I hope you enjoyed my review and found it helpful. If you have your own review for 5K Formula I would love to hear it. What you think about it? Leave your comments below. 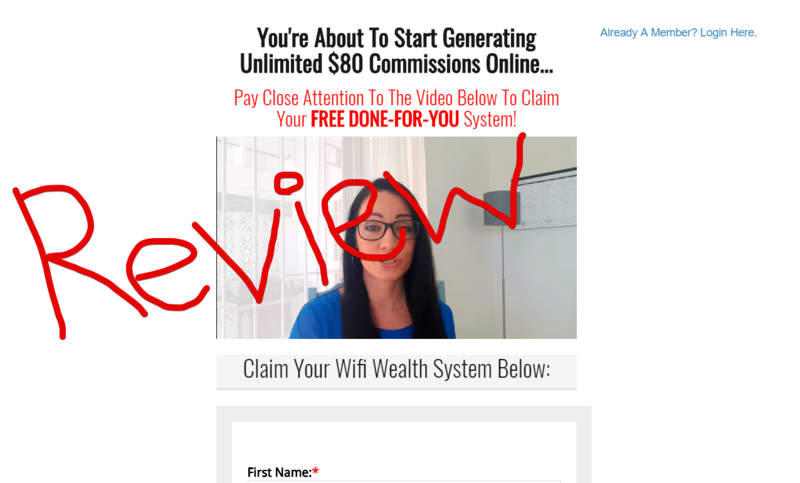 Wifi Wealth System Review – Unlimited $80 Commissions or a Scam? 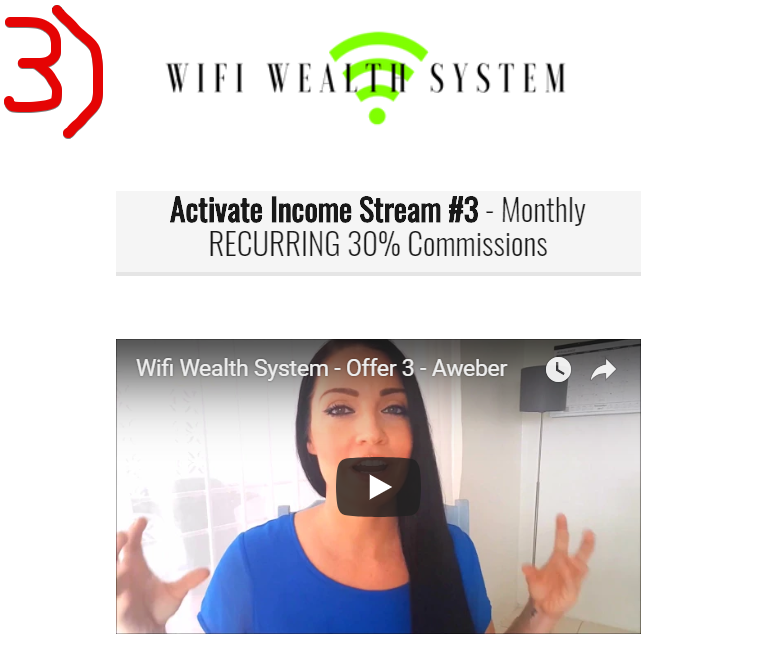 Wifi Wealth System is a system created by a woman named Angie that claims to be able to provide you with unlimited $80 commissions. But does it really live up to all the hype or is this just a waste of time to get involved in? Is Wifi Wealth System a scam that you should avoid? In this review I will be going over how the system works. If you went through the videos that Angie put together then you probably have a fairly complete idea of how this works, but there are a few things I will better explain. When you first start out watching the introduction video for the Wifi Wealth System Angie tells you that she is going to provide you with her exact $400 per day wealth system. She claims that this is a “free done for you” system and that there are “no strings attached”… It is 100% free to you. Is it really free? The truth is that Yes the system is free, however you will have to pay money to set it up, as you will see. Now why is she giving away the system for free? This is a question that she does not answer and the answer to it is because she is making money off of you and others that join, which is going to be the same thing that you will be doing as well as everyone also joins. She tells you that there are not many copies of the system and that you’re going to want to sign up ASAP, but this is likely not true because systems like this usually allowing as many people as they possibly can get since this is how they make money. The system is free to use but funnels people into other offers. So when you join the system for free you will then be funneled into joining three other programs, some of which you will have to pay money for. 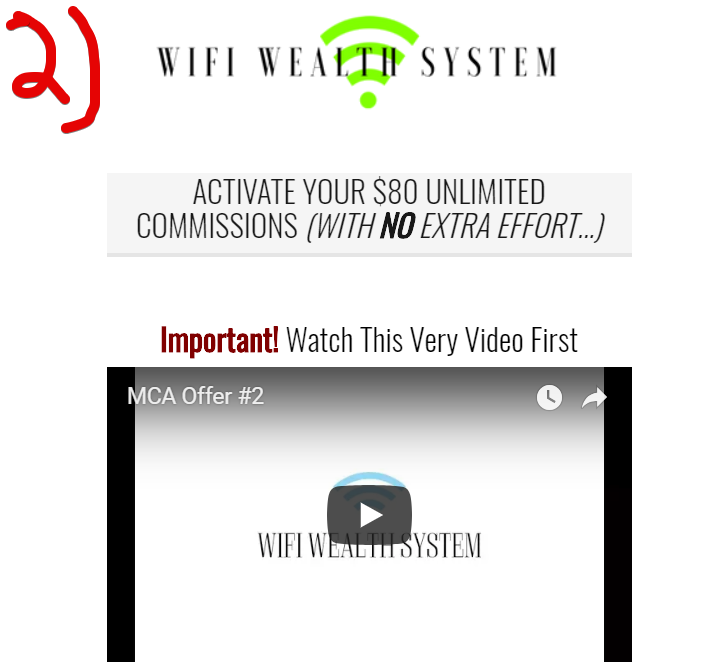 Then what you will do is go out and promote this same Wifi Wealth System two other people and when they join for free they will be funneled into these same three offers. When they spend money buying into these offers you will then make money. So all you will be doing is promoting the final system and it will then be funneling people into these three offers just as you are funneled into. There are quite a bit of funnel systems like this out there. Digital Genius Lab, Freedom Funnel Systems & Funnel X Project are three others that I have reviewed recently. The first step of the final is to join Ebates. This is a cash back app that pays people to shop. There are many apps out there like this, such as Ibotta & DOSH. Basically what they do is get paid for promoting brands and products and pay customers in the form of cash back to shop. But anyways, that isn’t the focus of joining Ebates here. 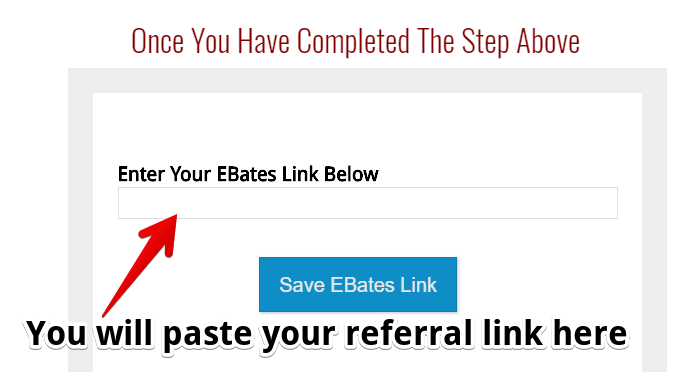 The focus here is that you can earn referral bonuses when you get others to join Ebates as well, which the funnel system will be doing for you when you promote it. You will be able to earn up to $25 per referral once they join and spend money through Ebates. Step two is to join MCA, or Motor Club of America. MCA is mainly a roadside assistance service, similar to AAA, but they also provide other services as well. And of course the part we are interested in here is the lucrative referral program that they have. Sure… Being a member and getting roadside assistance is great, but the reason for joining this offer is because after joining you can then refer others to join and get paid up to $80 in commissions. Said the same thing happens here as I explained in the first step… You will join and then submit your referral link into the funnel system. It is very common to see systems like this promoting MCA. Many people joining Motor Club of America are doing so just to be able to promote it and earn commissions rather than joining for the actual services provided. In the third and final step of this sales funnel is to join Aweber. 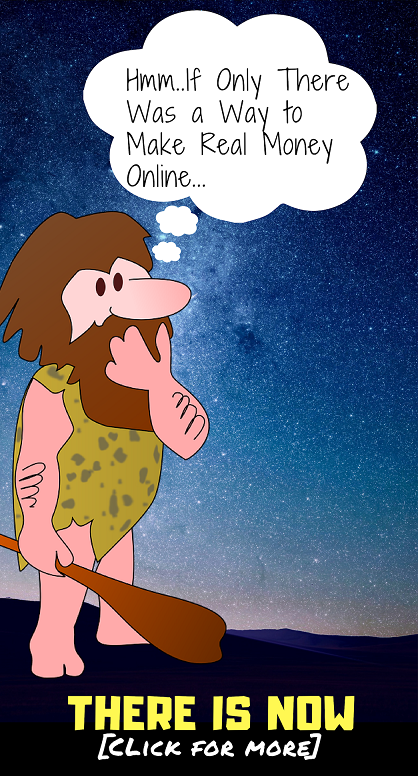 Now what is Aweber? It is an autoresponder service that allows you to build an email list that you can send automated emails out to. This is one of the most important steps of the funnel. This is where the person promoting the Wifi Wealth System captures people’s emails and builds their list. The purpose of this is to be able to contact someone if they choose not to join the system. Just think about it. If you did not capture someone’s email and they don’t join the system then there is no way to remain in contact with them. But if you do capture their email you will be able to follow up with them by sending automated emails via an autoresponder like Aweber. Anyone who has been involved in online marketing for a decent amount of time knows how important this is for business. And besides an autoresponder like this being very important for promoting this funnel system, you will also be able to earn 30% commissions when others join the funnel system through you and purchase Aweber. How Will You Drive Traffic to The Funnel System? So pretty much your only job is to drive traffic to the funnel system. The funnel system will do the work of funneling people into the three offers that can potentially make you money. But how do you drive traffic to the funnel system in the first place? There are about a thousand ways you can go about doing this, Facebook ads, social media marketing, PPC advertising, YouTube, SEO, etc. What Angie focuses on with the training that is provided is buying traffic through a website called Udimi. On Udimi you can purchase solo ads and drive traffic to your email capture page, which will be followed up by the funnel system. I personally have never used this service but I do know that it is legitimate and that some people have seen very good results with it. Like I said the funnel system is free but if you want to get everything set up correctly you will have to take out your credit card because you will have to join the offers. Ebates is completely free to join. So you will not have to actually pay any money to make money when people are funneled into this offer. The way you will make money here is you will receive a $10 referral bonus when a person that you have referred makes a purchase of over $25 in the referral period after joining. With MCA you will have to pay money right away. The cost of the “total service package” and access to the affiliate program is $19.95 per month. And with Aweber the prices will range a lot. They give a free 30 day trial which is nice when you’re just starting out, but after that you will have to pay a minimum of $19 per month. Then as more people get added to your email list you will have to pay more and more, going up to $149 at most, which is something you will more than likely never reach. The good thing about this is that, while you do have to pay more for the more subscribers you have on your list, you should be making plenty of money at these points to be able to cover this cost. Final Thoughts… Will This System Work? 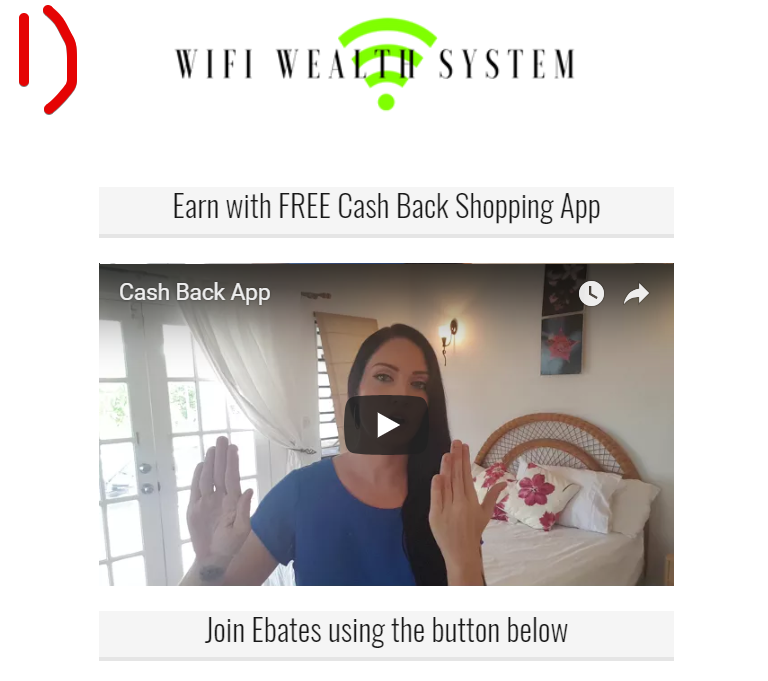 Can the Wifi Wealth System work? Absolutely it can work, but the real question is whether or not it “will” work. I see systems pop up like this all the time and it usually they did not last all that long, which leads me to believe that they simply do not work all that well. Just think about it for yourself… You are very hesitant to join which led you to doing the extra research and reading my review right now. When you go out and promote this system many of the other people are going to be thinking the same thing and will be hesitant to join. There probably will be some people making some decent money with this but I would bet the overwhelming majority of people are going to make very little money. But is this a scam? No I wouldn’t call it such… although I don’t personally care for systems like this that get people to join to make money online and then just get them to promote the same darn system to others in order to make money. Freedom Funnel Systems Review – Is This a Scam? Freedom Funnel Systems claims to be a free funnel system that anyone can use to make quite a bit of income online. It claims to be completely automated once you set it up and seems to be really awesome. But is it really? Most online marketing products seem amazing when they are advertised but many of them failed to perform. Is this a scam somehow? In this Freedom Funnel Systems review I will be going over how the system really works and what you need to know. It can be confusing if you have never seen a funnel system like this before and you might not really know what you’re getting into. This video was presented by Pat Patterson and told a pretty horrific story of how he used to be a police officer and nearly died. Apparently at one point he was beaten and attacked by a pit bull. He thought he was going to die and could only hear police sirens in the background. He knew help was coming but was not there yet. It’s crazy because this whole story is all part of the sales pitch to lure people into Freedom Funnel Systems. He relates this to people watching the video by basically asking if you are helpless and know that help is coming, but just don’t know one. And then of course he proceeds to tell you that this Freedom Funnel Systems is the help you have been waiting for. Yeah I know… It’s a pretty ridiculous sales pitch. Whether the story about Pat Patterson being a police officer or not is true doesn’t really matter to me. If it is true and he really was attacked like that then thank God he is all right, but the point of this review is on Freedom Funnel Systems itself. The attention grabbing videos that lure you in don’t matter much… There are probably plenty of them out there and their only real purpose is to get you to look at the system. What Is Freedom Funnel Systems? 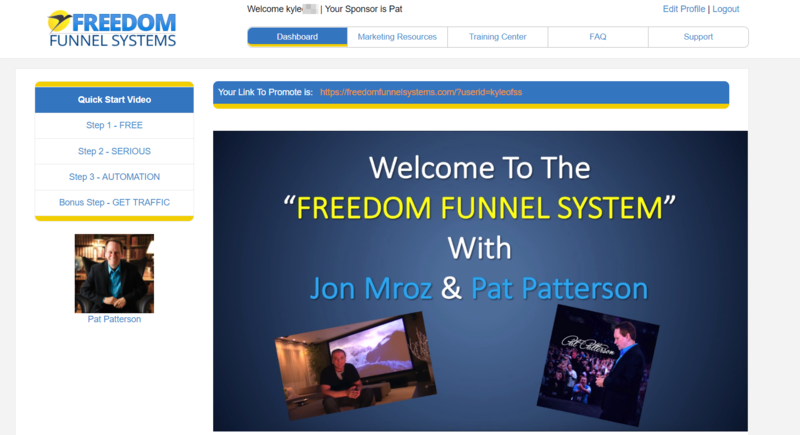 Freedom Funnel Systems is a system created by Pat Patterson and Jon Mroz. Jon seems to be the main guy behind it and claims he spent thousands upon thousands of dollars creating it. And of course it is all free now for you and other people to get. You can get access to the same income streams and funnel system that is making Jon over $30,000 per month. Crazy right? What’s the catch? While the catch is that it is not free and you will have to pay to use the system in its entirety, but I’ll get into this later. First I want to go over how the system works and give you a high level overview. Freedom Funnel Systems is a funnel system that gets people to sign up for different offers that can make you money. So basically what you will be doing is driving traffic to the Freedom Funnel Systems sales page, the same one that you saw, and then those people will be presented with the same offers that you are presented with. The Freedom Funnel Systems funnel itself is free but the offers that you and others will have to join or not free. So you join and first sign up for these offers, then you promote the Freedom Funnel Systems as a moneymaking opportunity to other people, they join and sign up for these offers as well which in turn makes you money. The first part of this funnel is to sign up for Express My Cash Freebies. This is a program that promotes a free trial offers for all sorts of big businesses, such as Netflix, GameFly, etc. and pays people to refer others to sign up for free trials. So what you can do here is join and then refer others in, getting paid when they sign up for a free trial. Express My Cash Freebies gets paid from the companies that are behind the offers that is promoting and they pay you some of this money when you get others to sign up for these free trial offers. My Lead System PRO is in online marketing service that gives you the ability to create lead capture pages, provides you with an autoresponder, training on traffic generation, and other things. If you don’t know, a lead capture page is the page that you drive traffic to in order to get someone to enter their email address, and an autoresponder is software that allows you to send out automated emails to thousands of people at once so that you can follow up with them if they haven’t already bought into the offer your promoting. MLSP also has an affiliate program where you can get paid to get other people to buy this service as well. So when you promote Freedom Funnel Systems and that person buys into MSLP just as you are going to, you will get paid a commission. Pure Leverage it is very similar to MSLP. They provide lead capture services, and autoresponder, and training so that you can get others to join in and make money doing so. I honestly don’t really know what the point is of also signing up for this service because it’s pretty much the same darn thing. I’m assuming it is just to add another stream of income because you will also be able to make money when people buy into this when you are promoting Freedom Funnel Systems as well. Of course you’re going to need traffic to make this funnel system work. Your first going to have to drive traffic to Freedom Funnel Systems before you make money from any of these income stream. So how do you do this? Do you advertise on Facebook? Do you share your link on social media? Do you get people to visit your site via Google? While what they refer you to is what is called Traffic Authority, which is a traffic generation service where you can buy your traffic and send it to the page you want. And of course you will also be able to earn commissions when others you have referred to the funnel system buy their traffic here. Express My Cash Freebies is the only one that is free. You do not have to pay for this service and you can make money getting others to join trial offers. The way it works is that you first have to join trial offers before you are able to get paid by referring others to do the same. Is This System Worth Joining? Well the big question here is whether or not you will make money with this. It’s not a question of whether you can or not, all of these income streams that they are funneling people into will pay you, but is this really as easy as it seems? The answer is no… It is not as easy as it seems. I have seen many funnel systems that are virtually the same type of thing is this, such as Digital Genius Lab & Funnel X Project which I recently reviewed, and none of them seem to last very long. They seem to come and go with the seasons and the only reason that I can think of for this is that they just do not work all that great. I mean just think about it… You didn’t join right away did you? You were suspicious of this which led you to doing some extra research and eventually to reading my review here. If you do join the system and end up promoting it many of the people that you promoted to are going to be suspicious and do the same thing or just outright avoid it without even looking into it any further. Freedom Funnel Systems it is not really a scam but it’s also not really something that I like the look of very much. Basically what you’re doing is luring people in with the hopes and dreams of making money online and then the funnel system is getting them to buy into these multiple streams of income, which they will then be able to make money with when they refer others to the system. It’s just an endless cycle of buying into things all for the sake of getting others to buy into them to make money. I don’t know… I’m just not a fan of this kind of thing and I don’t really think it’s a very sustainable business model. But you can buy and if you want, I’m not telling you not to buy in. I will tell you that I’m definitely not going to though. The Funnel X Project, aka “Funnel X System”, comes off very scammy so its no wonder you are reading my review here. 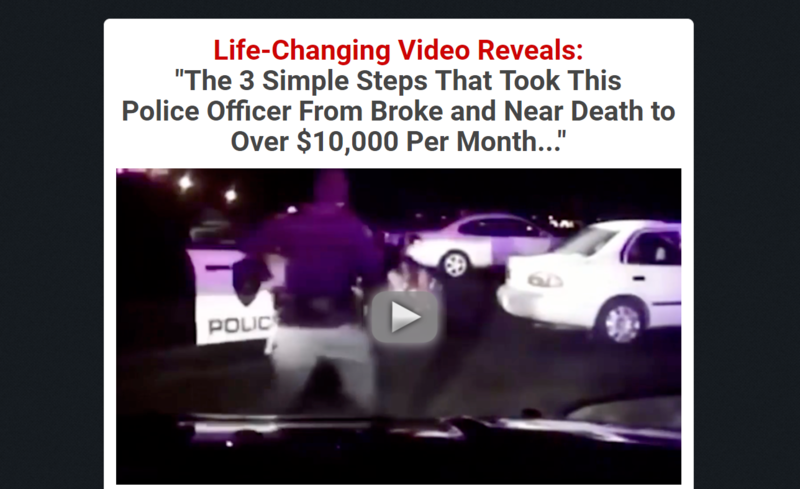 When I first came across this system I though it was surely just another scam. In this review I’ll be going over what Funnel X Project really is. It can be a little confusing how this all works if you are new to stuff like this so I’ll be giving a big picture view and my opinion of it all… which isn’t good. I am not promoting this system so I’m not going to be trying to make it seem better than it really is. 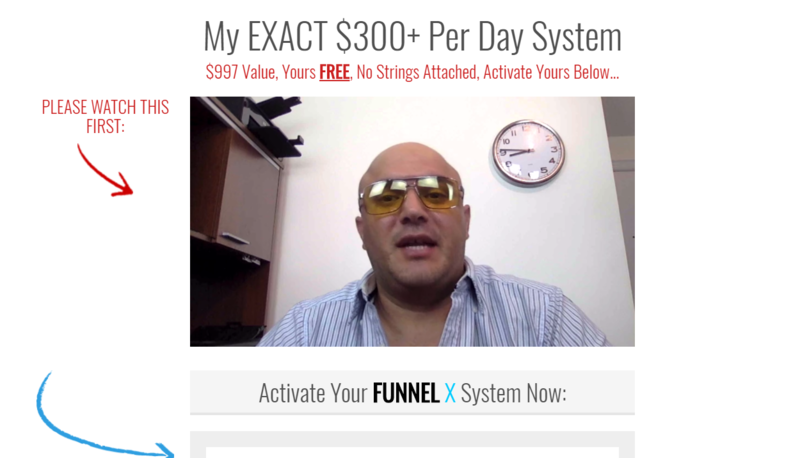 Funnel X Project is advertised as being a system that can make you $300 per day and profit. Sounds pretty good right? And to top it all off they claim it is normally priced at $997 and you can get it for free.… But there’s gotta be a catch to this right? Well, he tells you that it is “100% free no strings attached”. This system was created by a guy named David Dekal who claimed to have went from struggling to make money online back in 2013 to making $18,000 per month by his third month after hiring a personal coach. He then took a break from the online world for a while and has since decided to get back to it all. Now he is promoting this “special funnel” that he claims is making him and other people tons of money all while working very little. But what the heck is this “secret funnel” that he is talking about and how can you possibly make $300 a day just sending out emails for a couple hours each day? General Overview – Basically what you are going to be doing is sending out emails and getting other people to join the Funnel X System, which will make you money as you will see. That is the basic overview of the system. And step 1 to doing this with this system is signing up for MoneyLine. This is true and for your first step he tells you to sign up for your MoneyLine account at GlobalMoneyLine.com. This place is basically a very spammy marketing site where people promote their network marketing or work at home opportunities. You will see all sorts of crap on this site… I know because I used to use it. You can create a free account here and the purpose is to be able to communicate with other people and collect leads, which is the first part of the equation. Basically what you are going to be doing is telling everyone how great this funnel is that you just got and why they need to try it out too. This is the offer part of the equation. You will join MCA and then earn money when other people join. MCA, or Motor Club of America, is a MLM business that sells vehicle related services, the main one being roadside assistance. But this isn’t the main reason that people join. Sure, who wouldn’t love knowing that they can get roadside assistance whenever their car breaks down? I’m sure everyone would, but the main reason that people join MCA seems to be to earn money from it. You see with a MLM business like this you can recruit in other members to join and earn money from their efforts and off of their monthly membership payments. So for example, after you join MCA for $39.90 for the first month and a $19.95 per month charge thereafter, you can then go and recruit others to join MCA beneath you. You will earn commissions when they pay their monthly charge and you can also earn commissions from the people that they recruit in. So by referring people to the Funnel X Project they are then funneled into buying into MCA, just as you were, and you will be able to earn commissions from this. Another thing that David tells you to sign up for is a Aweber. This is an auto responder service that you can use to send out automated emails to people. I actually use the service for email marketing, but have nothing to do with this Funnel X Project. It’s a very popular service and works great. Basically what you will be able to do is send out automated emails to the leads that you capture. So you could set up a series of 20 emails or so to be sent out daily to each lead that you collect trying to get them to sign up for some offer. There cheapest plan is around $19 per month and just like MCA, you will be able to earn commissions from this. You will still do the same thing, send people to the Funnel X Project, where you hope they will join, and if they do they will be going through the same process that you do in which they will join all these other programs, earning you commissions. ClickMagick Is and analytics platform where you can track your finals to better optimize your conversions. The cheapest plan for this is $12 per month and just as every other part of this system, you can earn commissions with it when you get someone else to join Funnel X Project and they sign up for it. 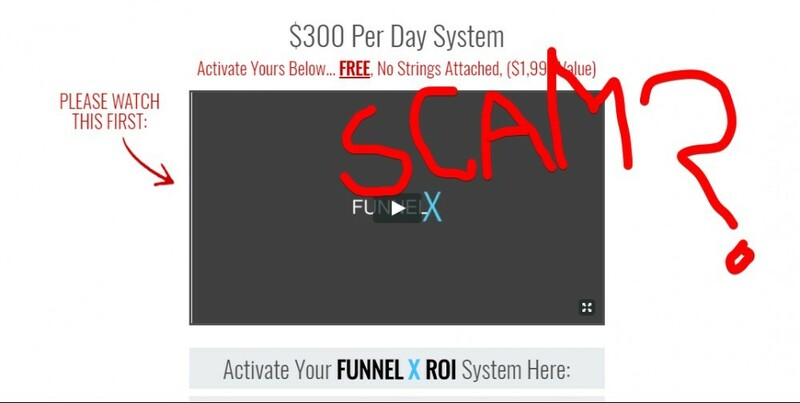 The Funnel X System itself is free. However, You are going to have to take out your debit card if you want follow along with the system. If you don’t spend money you will not make any money doing this so while the system itself is free, there are a lot of paid components to it. The only thing that you will be doing is promoting the Funnel X Project. When you promote the system and get other people to join, which will then lead to them joining MoneyLine, MCA, Aweber, etc., you will earn commissions from all these different programs that they join. How is this possible? Well after you join Funnel X Project and join all the programs that it is promoting in that are part of the system, you will be able to insert your affiliate links into the funnel. So then when you promote the Funnel X Project and someone goes through the funnel, they will be clicking on your affiliate links when they join these other programs. And that’s pretty much all there is to it. Its very similar to the Digital Genius Lab system that I recently reviewed as well as Easy Income System which also promotes MCA. You can absolutely make money with this but you can make money with a lot of things online. The real question is whether or not the time you put into this will pay off. It isn’t a question about making money. All of these different programs that Funnel X Project is funneling people into buying do pay people to get others to join. There is no doubt about this. However… I can pretty much guaranteed you that you are going to find this to be more difficult that it seems. I know this because I have seen plenty of other programs that work in similar ways to this before. The problem is that like you are now, many people are going to be suspicious of them and will avoid joining. Really its just a big marketing funnel. You are joining MCA and getting others to join just to make money and not really for buying the product itself. People tend to avoid programs/systems that work like this. I definitely would not call Funnel X Project a scam, however I would say its a bit of a “shady” system for making money online. You are luring people in with the hopes and dreams of making $300/day and then you are making money off of them by getting them to buy into the same bunch of programs that you just bought into… all from the same darn funnel system. I don’t know…. join if you want to but this sort of thing just isn’t for me. Something else you might be interested in taking a look at is how I make money online. You can read my “make money online guide” here if you want to where I go over what it is that I do, how it all works, and what I consider to be the best way to get started is. And… it has nothing to do with some “secret funnel”.